Narek is a victim but he doesn’t see himself that way. He is a strong and generous man with a face and body shaped by history like the mountains of the Caucasus. Narek lives with his family along the ancient silk road in the forgotten village Zumzur: 72 inhabitants, 12 families, 2 cars and no shops. The war between Armenia and Azerbaijan from 92-94 left destruction and death in Karabakh and a territory filled with mines. Narek lost both his legs because of the war. What he isn’t able to do due to the amputation of his legs he is able to do thanks to his enthusiasm, his hands and his orange car. Narke isn’t able to leave marks on the ground but he can do it in the lives of others, and in the life of his village. 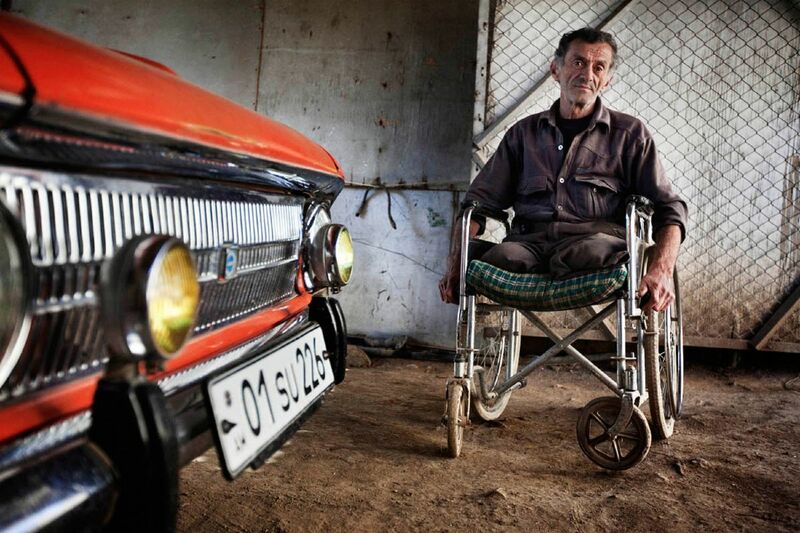 He cares about the car he bought 38 years ago when he was a soldier and Nagorno-Karabakh was part of the Soviet Union. Periodically he goes to Hadrut, a village with shops that is one hour away. The inhabitants of Hadrut have never seen Narek’s car dirty. He always cleans it before leaving home. And before leaving for Hadrut, Narek goes around his village to ask the others if they need anything. In the end, he always has a long list of things to buy. The Mark of Narek will be a documentary. I've been twice in Karabakh to shoot it. Now, I just need time to edit it...hopefully before I retire! The Mark of Narek, English subtitles, 3'42"